The most effective way you can report and abate graffiti is to download our Apple or Android Washoe County Sheriff's Office app on your phone or tablet. 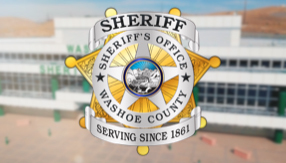 You can go to the Google Playstore or the Apple Store, type in Washoe County Sheriff and download the FREE app. If you see graffiti in your neighborhood, just click on the Graffiti Abatement button on the app. You can then take a photo of the graffiti which will be sent (along with the GPS coordinates) to the Sheriff's Office. Although not required, we ask if you could please type in your name and phone number with the photo in the event we have questions. Prevent it. Add motion lights or inexpensive video surveillance. Taggers generally don’t tag where they can be seen. Parent Awareness. There are key signs to look for if children are tagging. 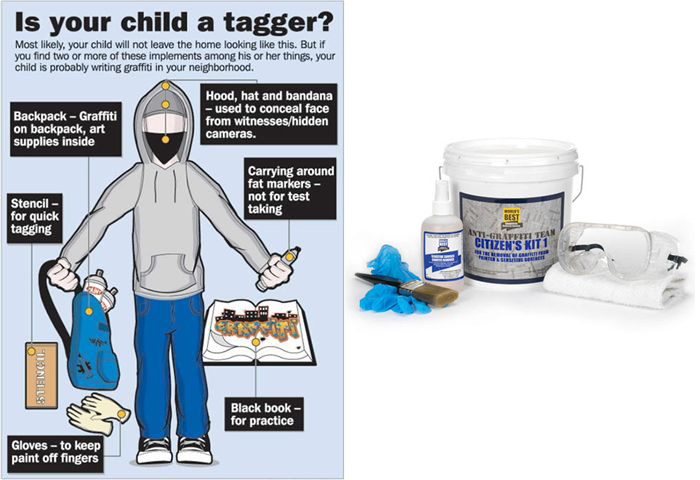 Juvenile taggers often “tag” in their rooms, backpacks, shoes, even their purses/wallets. The poster to the left also identifies other signs to look for. Also important – the school district prohibits spray paint on campus and would never include it in an art supply list. Report it. Report tagging in progress at or if discovered after the fact, you can file a report online. Take Photos: Take photos of the graffiti before you clean up. If you don’t then we can’t get restitution or charge for the crime. Don’t advertise: Don’t post graffiti on social or websites or any place that would advertise the graffiti. Taggers are looking for recognition. They scale walls, shimmy up poles and dangle upside down from freeway overpasses, all in the name of fame. Remove it. Remove the graffiti as quickly as possible to avert tagger notoriety and to prevent the paint from absorbing into the surface. There are chemical products such as graffiti wipes found at most home supply centers that can remove the graffiti. Follow instructions carefully based on your surface. Pressure wash unpainted concrete surfaces. What is Graffiti? Graffiti is defined as the defacement of public or personal property by means of painting, marking,etching or altering by other means without permission. Our Most Costly Property Crime: Graffiti is the #1 property crime in Northern Nevada. Graffiti Vandalism Affects Property Values It is estimated that up to $25,000 can be reduced from the appraised value of a home when there is visible graffiti in the area. Graffiti Can Bring Down a Neighborhood: Graffiti attracts other types of crime and accelerates neighborhood decay. Graffiti Vandals Are Criminals: Graffiti vandalism is a serious crime. Graffiti is not a minor crime or quality of life issue. It is not just a juvenile problem. Most graffiti vandals are involved in other types of crimes. When a graffiti vandal is arrested, other types of crimes are likely being prevented. Graffiti Is a Crime That Can Be Controlled: The key elements of controlling and managing graffiti are education, enforcement and eradication. With effective investigation and enforcement, Deputies can help to fight graffiti in Washoe County. Where Graffiti Comes From: While traditional gangs are active in placing graffiti, more than 80% of graffiti is placed by graffiti vandals called "taggers". Most taggers belong to gangs called "tag crews", or "tag krews". Why do they tag? The tagger's motivation is property damage and personal recognition, or "fame". They gain this fame by placing mass amounts of graffiti and tagging difficult or dangerous locations. Many taggers claim to be addicted to graffiti and tell investigators that they cannot stop tagging. Graffiti: A Gateway Crime - Taggers are attracted to graffiti because they have little respect for themselves and the property of others. The individuals who are drawn to graffiti involvement are impulsive and have little regard for the law. Taggers will often become involved in other types of crime, including crimes of violence. Identifying a Graffiti Vandal: Most active graffiti vandals are males age 13 to 30. They are from all socioeconomic backgrounds; however most are from middle to upper middle class families. The Equipment: Many taggers will wear loose fitting clothing which allows them to conceal their graffiti implements. Some will use a backpack which they call a "tag bag". The items they will use include multiple cans of spray paint, large markers, pre-tagged stickers called "slappers", special spray-paint can tip kits and practice books they call "piecebooks" or “blackbooks”. The Methods: Taggers will most often tag walls and areas which are highly visible to the public and other taggers. This is how they achieve their mission and gain fame. More daring taggers will use repelling gear, drop ladders, ropes, roll ladders or other means to tag bridges, overpasses and freeway signs. The more difficult the location, the more fame a tagger will gain. Occasionally taggers will vandalize police vehicles and buildings. It is a sure way to gain fast credibility in the graffiti world. The Attitude: Taggers want nothing to do with legal methods of placing art. In order for their work to be "real graffiti", it must be illegal.